The history of robots has its origins in the ancient world. The modern concept began to be developed with the onset of the Industrial Revolution which allowed for the use of complex mechanics and the subsequent introduction of electricity. This made it possible to power machines with small compact motors. In the early 20th century, the mion of a humanoid machine was developed. Today, it is now possible to envisage human sized robots with the capacity for near human thoughts and movement. The word “Robot” was coined in 1920 by Karel Capek and his brother, Josef Capek. Karel was a Czech writer looking for a word to call the artificial creatures in his play. Unhappy with the word laboři (or ‘workers’ in Latin), his brother suggested roboti from the Latin word robota (meaning ‘serf labor’). In 1944, science fiction writer Isaac Asimov decided to expand on that and coined the word “Robotics” for use in his short story ‘Runaround‘. It later became a recurring theme in many of his books which helped to spur popularity and increase usage of the word. Aside from mythological tales which include mechanical servants built by the Greek gods, the clay golems of Jewish legend and clay giants of Norse legend, the first real documented instance of a robot was in the 4th century BC by the Greek mathematician Archytas. He created a wooden, mechanical steam-operated bird that he called “The Pigeon”. The bird is believed to have been suspended from the end of a pivoted bar, while the apparatus revolved by puffs of compressed air and steam. Documentation of “The Pigeon” was found in the writings of Heron of Alexandria, who described it as “operated by water, falling weights, and steam”. Not only does it lay claim to the first known robot, but it is also the first documented record of a scientist attempting to figure out how birds fly. Robots and robotic technology is evolving at an ever increasing pace. We’ve sent robots into space to explore planets for us, into nuclear reactors, and even into hostile situations in place of soldiers in the war on terror. The industry itself is branching out in unpredictable, yet exciting ways. 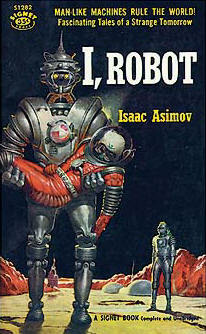 This cover of I, Robot illustrates the story “Runaround”, the first to list all Three Laws of Robotics. In 1941 and 1942, Isaac Asimov (I loved this guy) formulated the Three Laws of Robotics, and in the process of doing so, coined the word “robotics”. Since then, Asimov’s laws of robotics have become a key part of a science fiction culture that has gradually become mainstream. HAL2000, the robot that did not follow the “Three Laws of Robotics”, Ask Dave! In recent years, roboticists have made rapid advances in the technologies that are bringing closer the kind of advanced robots that Asimov envisaged. Increasingly, robots and humans are working together on factory floors, driving cars, flying aircraft and even helping around the home. There are 3 robotic rovers on Mars now, Spirit, Opportunity and Curiosity. They were sent to study the water history on the Red planet. The rovers contain cameras and spectrometers, which is a lot more than about 20 years ago, when rovers only carried large cameras and Landers. Scientist can now analyse the spectrum of Mars rocks easily. New Rovers now have the latest technology, such as the very sturdy robotic arms. This, when compared to previous rovers, is an extreme leap to the robotic age. When the Mars Curiosity Rover touched down on the red planet’s surface in 2012, it was a huge deal for space exploration. But in just a few years the options for exploration will widen considerably. Technology such as drones and augmented reality is rapidly becoming more commonplace on Earth, and as it continues to develop so does its potential for use in space. Our ability to explore planets and areas of space will, without a doubt, be enhanced by technologies that are able to work autonomously and move freely.The devices that are being developed today will, hopefully, prevent scenarios such as the Philae Lander being lost on the surface of the comet 67P. Remote-controlled aircraft were originally developed for use by the military. But there’s more to unmanned aircraft than warfare. Drone technology is increasingly being applied elsewhere, including for things like monitoring ice floes in the Arctic, search and rescue, whale watching and tracking the movements of orangutans in Sumatra. Scientists are also considering using drones in other dry regions such as Saudi Arabia and Cyprus. In these kinds of environments, the difference in daytime and night-time temperatures allows heat-sensing cameras to detect slight differences in heat signatures of buried stone structures. Unmanned underwater vehicles (UUV), sometimes known as underwater drones, are any vehicles that are able to operate underwater without a human occupant. These vehicles may be divided into two categories, remotely operated underwater vehicles(ROVs), which are controlled by a remote human operator, and autonomous underwater vehicles (AUVs), which operate independently of direct human input. The latter category would constitute a kind of robot. Unlike other forms of unmanned vehicles, unmanned underwater vehicles can have difficulties communicating underwater. This is due to a combination of the water distorting transmissions, as well as the multitude of obstacles that the robot must maintain an awareness of. The robot’s ability to communicate in real-time is extremely hindered during submerged operations. Moreover, as of 2012, their ability to operate for long periods of time is hindered by the absence of an adequate power source that is safe to be used in such close proximity with water. The USS Navy does say, that by 2017, they expect to have solved this issue and that they plan to have a drone capable of staying out at sea for up to 70 days at a time. A remotely operated underwater vehicle, commonly referred to as an ROV, is a tethered underwater vehicle. ROVs are also used extensively by the scientific community to study the ocean. A number of deep sea animals and plants have been discovered or studied in their natural environment through the use of ROVs: examples include the jellyfish Bumpy and the eel-like halosaurs. Science ROVs take many shapes and sizes. Since good video footage is a core component of most deep-sea scientific research, research ROVs tend to be outfitted with high-output lighting systems and broadcast quality cameras. Depending on the research being conducted, a science ROV will be equipped with various sampling devices and sensors configured to work in the extreme environment of the deep ocean. A working class ROV being retrieved by an oceanographic vessel. Below, an example of a research UUV: Icefin. A new type of robotic submersible craft is giving scientists unprecedented access to the freezing waters beneath the icy crust of Antarctica. With space on board for a number of instruments, Icefin is more versatile than the small craft usually deployed this way, and it can range further under the ice than big submersibles launched from open water. If a robot plunges into the ocean of an icy moon (That is the idea of NASA for the next exciting Space mission), perhaps near Saturn or Jupiter, its main problem will be figuring out what to do next. Even at light speed, it takes hours for communications to pass back and forth to Earth. This means any robotic explorer would need to be smart enough to avoid danger, and sophisticated enough to figure out what information to send back.An underwater robot is somewhat analogous to a space-bound robot, as both face the difficulties of communication. Robots aren’t new to healthcare.Since 2003, the Da Vinci Surgical system has conducted more than 20,000 surgeries and has paved the way for robotic advancements in healthcare. In fact, vendors have introduced a number of new robots to better provide care to remote patients, help with various physical therapies and — similar to the da Vinci system — help perform surgery. For example, Magnetic Microbots are a group of tiny robots used in various operations, such as removing plaque from a patient’s arteries or helping with ocular conditions and disease screenings. Other robotic advancements are used to better the day-to-day lives of patients, helping them eat, like the Bestic Arm, or helping a patient regain her ability to walk, like many of Toyota’s Healthcare Assistants. Everyone knows that being a soldier is a dangerous job, but some of the tasks that soldiers are required to do are more dangerous than others. Walking through minefields, deactivating unexploded bombs or clearing out hostile buildings, for example, are some of the most dangerous tasks a person is asked to perform in the line of duty. What if we could send robots to do these jobs instead of humans? Then, if something went wrong, we’d only lose the money it cost to build the robot instead of losing a human life. And, yes it is scary, but we could always build more robots. Broadly defined, military robots date back to World War II and the Cold War in the form of the German Goliath tracked mines (see a photo above) and the Soviet teletanks. The MQB-1 Predator drone was when “CIA officers began to see the first practical returns on their decade-old fantasy of using aerial robots to collect intelligence”.